The deer have been out in spades this fall. 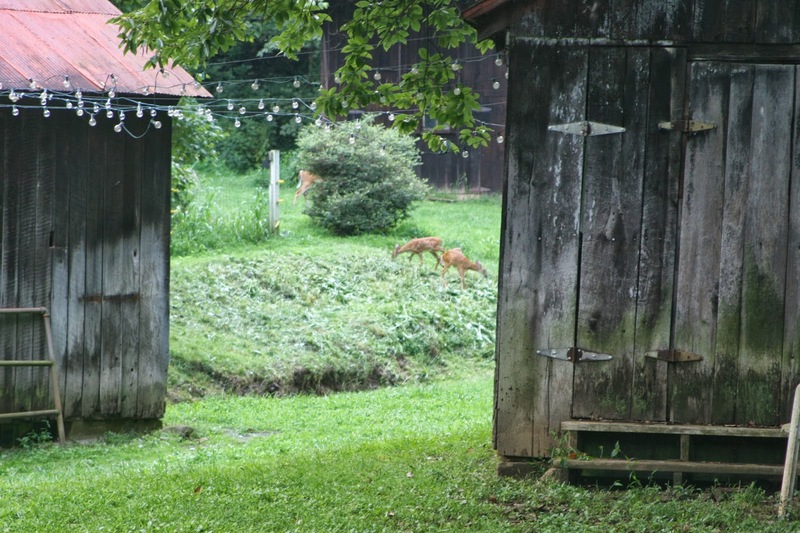 Last week I stepped outside, took several steps and felt I was being watched. I looked over my shoulder to find a trio of deer frozen in mid-munch, at the corner of the house. I don't have a good long lens, so I can't get really great photos that are up close and personal. I found a young deer all alone outside the bathroom window, only to watch the rest of his clan, meander down the drive. The little ones are quickly becoming rather big ones. One dusky night I looked up and swore there were moose on the property. (I didn't have on my glasses) No moose, just squirrel and some rather large deer. This was a thwarted attempt to get through the garden fence. 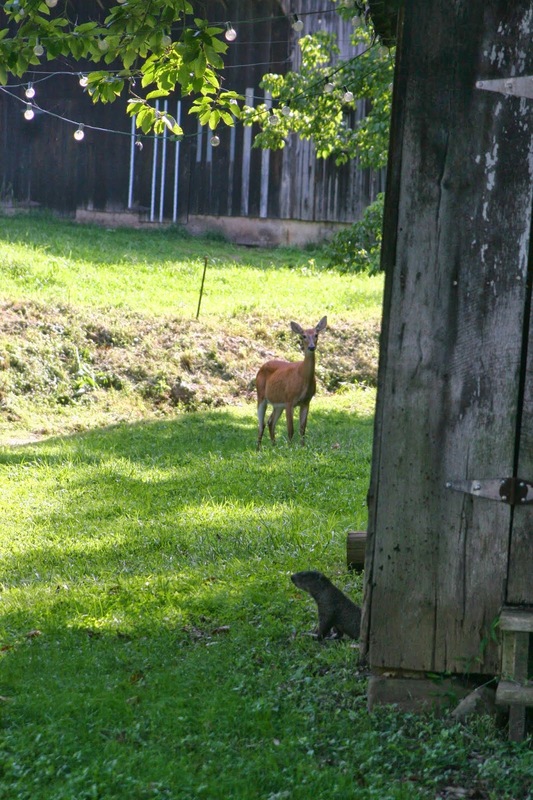 Here, our resident ground hog watches the late afternoon roaming. I had to leave my 'herd' when I sold the Farm, and it broke my heart. Every Hunting season, for years, I took down the bottom 2 strings of barbed wire, to allow the 'Walking Wounded' survivors of Hunting Season, to pass thru, without having to jump OVER onto your property. One year,there was a Doe, dragging a leg which had been blown off at the very top...it was still connected by skin and tissue. She used this pass-thru every day...then she got sick from the infection I assumed...didn't see her for awhile. 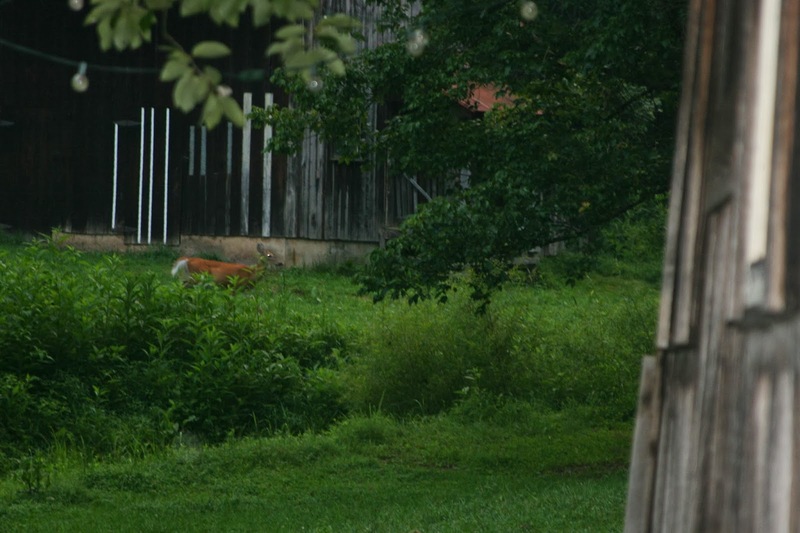 Suddenly she arrived, showed up at the Salt Lick (T&M Trace Minerals) I put out for the Deer to keep them away from my Garden....and also where I feed the Horses...always dropping Whole or cracked corn purposely. She was 'managing' on 3 legs, I named her "TriPod". Come Spring she showed up with a Fawn! She was a good mother, even taught the baby to go UNDER the Barbed Wire with her. Wonder of wonders, her 2" stump was moving more and more to the center of her chest as a large muscle. By Fall that year, she took her first leap OVER the Fence! She made it. 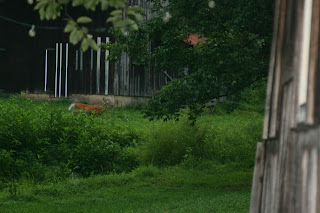 She and the now 6 mos old were regulars at my 'Feeding Station' by the barn. 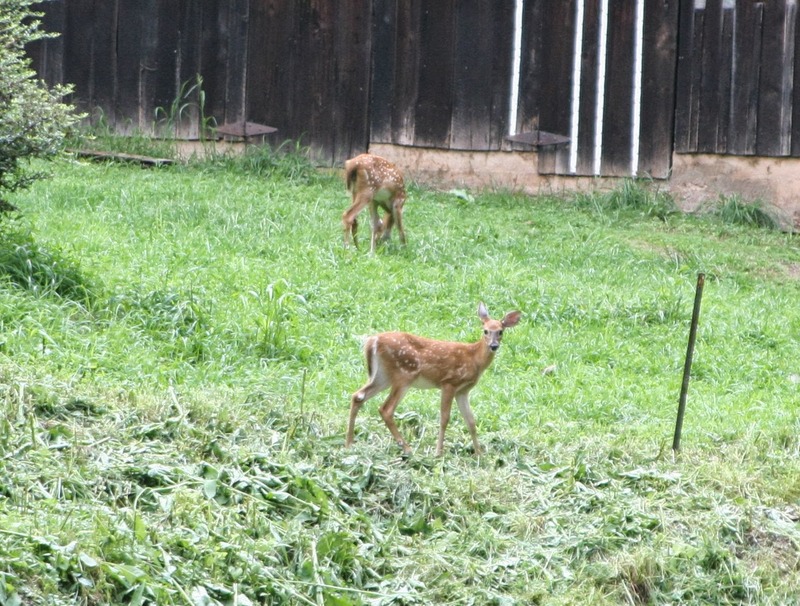 Next Spring, there was a brand new set of TWINS....and her yearling. 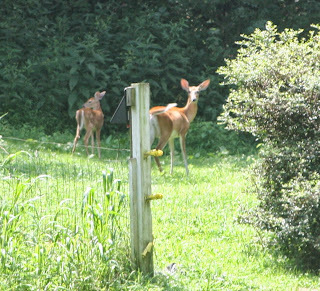 I could hand-feed them, they would come up to my back door and stare in if I was late in feeding the Horses! In the next few years I had a 'herd' of TriPod's Progeny....each with it's own personality. I have pictures of her leading them out of the woods...AND THEN ONE DAY, SHE..WHO WAS AS HEALTHY AND STONG AS A HORSE, DISAPPEARED. Her 'kids' were distraught....as was I. I put a poster on the Shirley Bulletin Board at the P.O, along with her picture...."LOST...Has anyone seen TriPod...." etc. The next day, there was a big chunk of Deer Hair nailed to my poster, and it said. "YES, I DID!" and it was signed "The Shirley MOfia". "O", not "A"....ignorance~~~~...the 'kids'kept coming, but then I had to sell my beloved Farm, and the New people, didn't want to encourage them~~~~sigh. (Put T&M salt Licks 5feet away from your garden, and they will go to them rather than try to leap your fence. I used 1 on each side, but I had a small 15x30' garden....you may want to put 2 on each side. They will last thru the winter and help the Deer survive through it..healthy.) 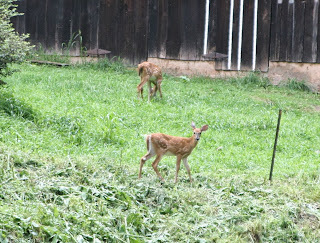 We (Marilyn and I) have 2 deer, a Mama and a Fawn ...in our combined back yards...IN THE CITY! Love it.